Craig suggested these pellets & my New Wildcat .22 that I just bought loves these pellets, 8 shots thru the same hole at 50 yards no wind. These pellets were recommended to me by Craig at Straightshooters, and I am very glad he did. 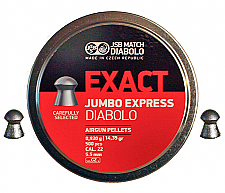 I am new to the world of airguns, and since my intention is a serious hunting rifle, he told me to run a tin of these through the rifle to smooth things out and get used to the gun. I got them along with a RWS 460, and I can't believe how these pellets are doing out of this gun! I shot about half of the tin through the gun, not really aiming at anything. The gun started feeling pretty smooth, so I mounted the scope and sighted in at 10 yards. It was a very easy process, and the first group of 3 shots after zeroing at 10 yards was WELL under a half inch. I haven't gone through the process of finding the pellet that this gun likes, but I believe it is going to be pretty hard to beat these. 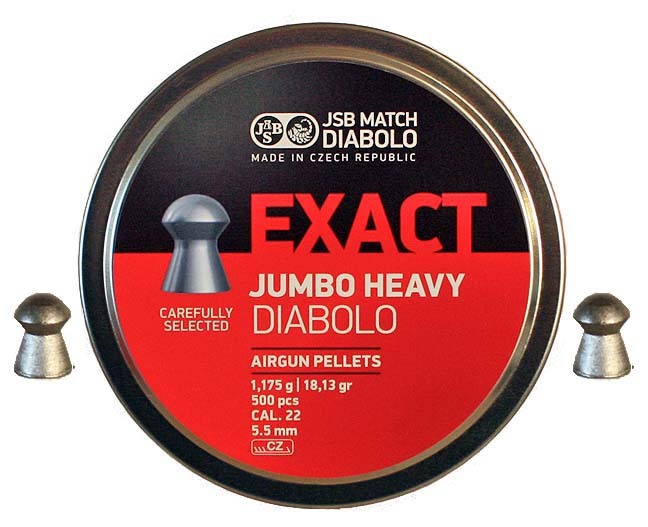 I have the sampler from Straightshooters, and I will certainly go through the process of finding the "right" pellet for this gun, but man, it is going to take a pretty special performance to overtake the JSB Exact Heavy Diablos. Just after zeroing at 10 yards, I took a Eurasian Collared Dove at 15 yards that fell dead and didn't even twitch. The pellet did it's job, and I'm already extremely happy with the setup I have. If it gets better than this, I will be having more fun than one human should be allowed to have. Advantages: I like the .22 caliber simply because they are easier for my fat fingers to hold on to. As far as the pellet itself, I think it is great! It shoots very well so far out of a brand new rifle, hits like a brick, and is very consistent. As of today, I've taken three critters with this pellet, and none of them knew what hit them. I'm trying hard not to be biased towards this pellet before going through the process of finding the "right" pellet for this gun, but it is becoming more and more difficult. Disadvantages: None so far. This pellet has been very accurate, very consistent, and very deadly. What could POSSIBLY be a disadvantage?? I bought the pellet sampler. I picked a 80 deg.day no wind. 40yd target and tested all pellets, 10 shots on bench rest. This pellet gave me 3/4in. groups more consistently then all other pellets in the sampler-WTH, I bought more daaa.